Mishimoto is excited to announce that we're starting development for a 2015-2017 F-150 transmission cooler! Check out the first post below and feel free to share any feedback! Ford’s F-150 is a staple of jobsites around the world and apparently a staple of this blog. It seems we never run out of projects for the F-150 and with thirteen generations to choose from, it’s unlikely we ever will. Our latest endeavor into the F-150 platform focuses on the 2015-2017 model-year transmission coolers. On top of the multitude of F-150 posts living on our blog, you’ll find a wealth of posts about truck transmission coolers. For some reason, truck manufacturers tend to underestimate the importance of their vehicles’ transmission coolers. Stock coolers on many trucks are often too small to cool the transmission fluid during long periods of heavy towing, have some major flaw that causes catastrophic failure, or manufacturers don’t include one at all. 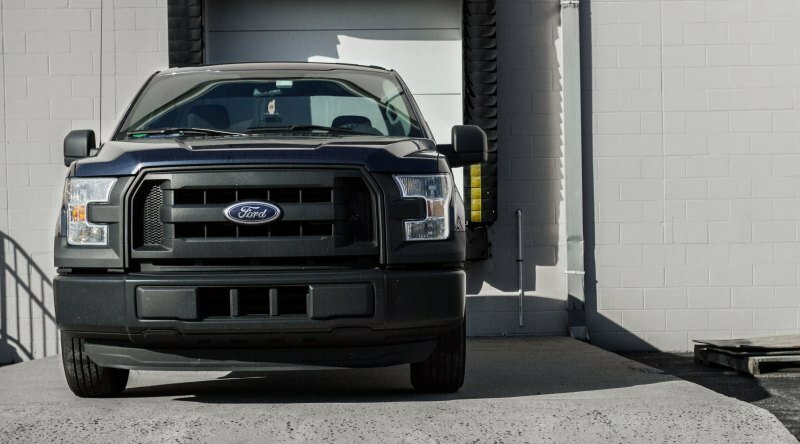 In the case of the 2015-2017 F-150, trucks equipped with certain tow packages did receive an external transmission cooler. While that cooler may work for many owners, those who tow in hot environments or have modified their F-150 to tow heavier loads have found the stock transmission cooler to be inadequate. So, we tore into the front of our 2015 F-150 to see how we could make it better. Even though the grille of the F-150 is almost as big as she is, our engineer was able to quickly gain access to the F-150’s cooling stack. We weren’t surprised to find a transmission cooler that could benefit from the Mishimoto touch. Extending across the entire radiator is a massive plastic mount that houses the stock transmission cooler. Instead of using all the available space, Ford elected to make their cooler only about half the length of the mount. This choice was likely made to reduce cost in production, and therefore reduce costs for the end consumer. After all, a huge portion of Ford’s F-150 customer base couldn’t care less if their truck came with a transmission cooler at all. But since you’re reading this, we’re assuming you do care if you have a transmission cooler. And, you probably care if that transmission cooler actually cools your transmission. You care that your F-150 can carry the weight. And so do we. We’ll be spending the next few months making a cooler that better utilizes the space behind the grille and provides more than enough cooling for any grade or trailer your F-150 comes across. We anticipate that this project will be simple. Unlike many trans coolers we’ve recently worked on, we were happy to see the stock transmission lines are connected to simple hose barbs on the cooler. That means no stubborn quick-disconnects or odd connectors that require complicated adapters and lines. The mounting will also be relatively easy; we can likely utilize the factory mounting locations. We will face some tough decisions on the core itself, however. The stock transmission cooler core is a stacked-plate construction, which makes it tough and durable. But, a stacked-plate cooler may pose too much restriction to the transmission fluid when the core is extended across a larger area. We’ll have to test both stacked-plate and tube-and-fin cores to see which design strikes the best balance between flow and cooling. Before any testing can happen though, we’ll need samples to test. And before that, a model to build those samples from. And before anything, we’ll need measurements and the help of our fabricators to build a prototype. So, keep an eye out for the next updates where we’ll go through each step of our process in making this 2015-2017 F-150 transmission cooler. Feel free to give us your feedback and ask any questions you may have in the meantime. bespurcell, Tabasco, Sirikenewtron and 2 others like this. 2017 3.5 SCREW Lariat. Adding to it regularly. Will this be compatible with 2017 Gen2 3.5 non-raptor? The cooler pictured above does not come with any 2018 truck equipped with the 10 speed. Only the normally aspirated 3.x with a tow package has such a cooler. Ford has equipped the 2.7, 3.5, & 5.0 with a water/transfluid cooler mounted in front of the 40-speed, regardless of tow or Payload capacity. my 2016 wants one of these. Doesn't a stacked plate cooler flow better than a tube and fin? the tube and fin is most efficient at the cost of increased restrictive pressure. Each plate flows fluid from one side to the other, whereas a tube and fin is a single long tube. My understanding is the more plates it has, the lower the restriction. A long single tube is most restrictive...or am I miss-informed. Last edited by TCP2; 09-21-2018 at 02:51 PM. Where do you get one of these 40 speeds? 10 could be argued as too many. Had to rib you before someone else did. I deserve any and all I got coming. I've certainly dished it.